Special Rapporteur on freedom of religion or belief Heiner Bielefeldt. “Every individual child is a rights holder in his or her own capacity as recognised in Article 14 of the Convention on the Rights of the Child,” the UN Special Rapporteur on freedom of religion or belief, Heiner Bielefeldt, recalled while presenting his new special report on the rights of the child and his or her parents in the area of freedom of religion or belief. 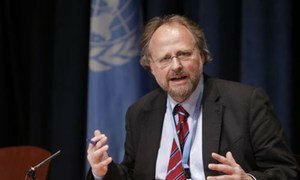 With regard to possible conflicts, the Special Rapporteur stressed the need for due diligence by the State when dealing with conflicting human rights concerns, ensuring non-discriminatory family laws and the settlement of family-related conflicts, and combating harmful practices. The expert highlighted that parents or legal guardians have the right and duty to direct the child in the exercise of his or her freedom of religion or belief. “Such direction should be given in a manner consistent with the evolving capacities of the child in order to facilitate a more and more active role of the child in exercising his or her freedom of religion or belief, thus paying respect to the child as a rights holder from early on,” he said. According to the Office of the UN High Commissioner for Human Rights (OHCHR), the Special Rapporteur's report also discusses issues related to religious socialization, religious instruction within the family, participation in religious community life, religious education in schools, the voluntary display of religious symbols in schools; respect for the evolving capacities of the maturing child, and non-discrimination on the basis of religion or belief. Amid escalating tensions throughout the Middle East, the country of Lebanon, known for its rich cultural diversity, can be a “ray of hope” for tolerance in a region beset by religious fanaticism, a United Nations human rights expert has said.